I have been making soap for a few years now. I must say…it is addicting. We do not buy any bar soap anymore, we just use what I make. This is the latest batch of soap that I made. Lavender. Every time I walk into the laundry room where it is curing I get a wonderful whiff of this soap. It spells amazing. I am pretty happy with just the natural color of the soap. I have made a few types of soap where the ingredients (like ground cinnamon) have altered the color and that has been fine. It just adds to the natural-ness of the soap I feel. I did add some finely ground oatmeal and some dill weed to this lavender soap. I tend to like a little “something” in there too. The dill weed is just there for effect – no dill smell to it at all. The little tiny dill weeds floating around in there seems to give is a bit of depth. Making a gardeners soap is next on my list. I love being in the garden, digging, planting, etc. I also wear gloves all of the time (well, most of the time). I found that I can keep my hands a whole lot cleaner if I just wear gloves. So gloves it is. There are still times I would like to have a soap that can do some scrubbing. So I will make one. I have made a coffee soap in the past and it was nice, but if I didn’t get the coffee ground ground real fine, they were a bit too abrasive, so I will use something else…. some of the loofahs that I grew. Yup, that was the plan all along. I will let you know how it turns out. I was scared to make soap for many many years until I read about it over at Down–to–Earth. Rhonda Jean completely took the fear out of it for me. I rounded up the supplies and off I went – and never looked back. 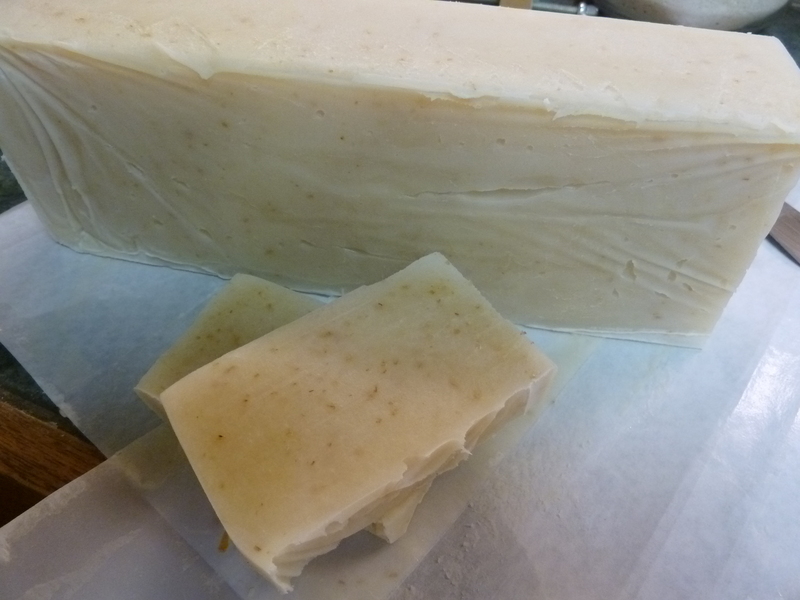 This entry was posted in Homemade, Soap and tagged Making cold process soap, Making lavendar soap. Bookmark the permalink. I’ve been intrigued by the idea of making soap for a while, but have never had the courage. I might just have to set aside some time this winter and make some! I’m curious to know how your loofah soaps turn out! Hi – I started by reading the tutorial that I linked to. Then I printed it on pages and taped them to he cupboard above me so they were easy to reference. But I basically memorized the steps so I didn’t have to stop and re-read. I was much more comfortable making it then. At first I used a microwave to melt and heat my oils. Now I use the stove top. I hope to make a soap with the loofah in the next month or so. A friend of mine just showed me how she makes her soap. The next night I dreamed about making soap, lol. Ooooh dreaming of soap making. I do dream about things I am really reading and learning, and thinking about. Something new – exercising the brain. That is great you have a friend to show you the process. You will have to let me know when you make soap. How wonderful ! It’s on my list of things to do. I once made bath bombs and bought all the stuff for them, but then decided they made my skin itch so I gave all the kit away. I get a lovely lavender olive oil soap from Neals Yard sometimes. It doesn’t lather much which suits me fine and lasts for ages, but it is quite dear so it would be good to make my own, thanks for the inspiring post ! Soap is one of those things – I am SO SO happy I make my own now. Wish I would have started years ago when I wanted to do it, and so glad I finally got around to it. It still has several weeks to cure and harden before I will use it. With our hot summer temps I have found I get a much harder bar when I make soap in the fall, winter and spring. There isn’t as much humidity in the air and our house is cooler. That doesn’t keep me from making soap in the summer, it is just something I notice. It is almost impossible to get lye here retail and hubbie doesn’t want me to do it. I remember looking for lye once to make the correct solution to dip pretzels in and couldn’t find it. The powers that be have clamped down along time ago on chemicals that are available to the public, something to do with terrorism and diy weapon making, all sorts of odd things that one can’t get easily anymore that are used that way… sad world. aahhh yes, meth labs and bombs. Bummer. Do you have any friends that make soap? Maybe you could make some soap with them their home!